Happy holidays from AST Products! AST Products, Inc. wishes you Happy Holidays, and a Happy New Year! ﻿BILLERICA MA, December 17, 2018 – For the modern cataract and refractive surgery, every intraocular lens (IOL) needs to be delivered into the patient’s eye safely and precisely. The Chicago Athenaeum Museum of Architecture and Design recognizes AST Products’ pioli™ IOL Delivery System as such a solution, naming it a GOOD DESIGN® Award winner for 2018 in the medical category. And this also marks the 1st IOL delivery system to receive such a prestigious award. The pioli™ IOL Delivery System is a CE-marked and US FDA 510(k) cleared single-use, sterile device intended to insert a one-piece foldable intraocular lens (IOL) into the human eye through a surgical procedure. It is a truly easy-to-use and unique IOL delivery system that utilizes a patent-pending consistent IOL-folding technology. The set consists of a single-use, sterile syringe injector with a silicone tip and a single-use, sterile LubriMATRIX™-treated cartridge. The tip of the plunger, housed in the injector, is covered by a silicone cushion that provides a good contact to the lens to ensure a smooth delivery. The GOOD DESIGN® Award (www.good-designawards.com) is the oldest and most influential Design Award in the world presented by The Chicago Athenaeum Museum of Architecture and Design (www.chi-athenaeum.org) in cooperation with The European Center for Architecture, Art, Design and Urban Studies to honor the best talent in design and manufacturing worldwide. This year marks the 68th year of the award and there were over 900 designs and graphics selected from over 46 nations worthy of the GOOD DESIGN® Award for their Design Excellence. For further information: Please contact Matt Connolly at mconnolly@astp.com. AST Products, Inc. develops and manufactures a range of ophthalmic surgical products used by physicians to treat patients with cataracts. Our ophthalmic product line includes the Asqelio™ soft hydrophobic intraocular lens, Asqelio™ Preloaded IOL Delivery Systems, and our premier intraocular lens (IOL) delivery devices, the pioli™ and lioli™ IOL Delivery Systems, designed for the implantation of a single-piece foldable intraocular lens into the human eye through a surgical procedure. The Asqelio™ Preloaded IOL Delivery System and both the lioli™ and pioli™ IOL Delivery Systems are pretreated with our innovative LubriMATRIX™ technology that offers a safe, simple and effective lens delivery. AST also provides environmentally-friendly medical coatings for a variety of industries along with analysis equipment and specially engineered plasma reactors that facilitate the application of our advanced surface treatment technologies. This was our second year exhibiting at the AAO Annual Meeting and Exhibition, and we’re happy to report it was another very busy and successful show! We’re excited be returning and exhibiting at AAO once again, next October in San Francisco! Check out our booth from this year’s AAO meeting in Chicago, where our pioli IOL Delivery System is on display! AST Products, Inc. will be exhibiting at AAO 2018, from October 27-30! Join us in Chicago for the American Academy of Ophthalmology's annual meeting and exhibition, and be sure to check out our lineup of IOLs and IOL delivery systems on display at Booth # 1949! As the conference officially comes to an end, we would like to thank everyone who stopped by our booth at this year’s ESCRS Congress! It was another successful and busy conference, and we’re already looking forward to exhibiting next year in Paris at ESCRS 2019! Until next time, Vienna! Check out some highlights from our booth below! We're excited to be here in Vienna for the opening day of exhibition at the 2018 ESCRS Congress and Exhibition! We're all set up at Booth B329, located toward the center of Hall B at the Messe Wien Congress Center. Check out this year's exhibit below! Exhibition opens tomorrow morning! We're really looking forward to this year's ESCRS Congress, and we hope to see many of you there! Come by Booth B329 to check out AST's newest product developments, the Asqelio™ Preloaded IOL Delivery System and pioli™ IOL Delivery System! In two days AST Products will be exhibiting at the ESCRS Congress in Vienna! This year we’re premiering our new Asqelio™ Preloaded IOL Delivery System, which we’re excited to announce received EU CE-marking approval in August. We encourage you to stop by our booth to bench-test our various delivery systems, including our new preloaded system. We hope you’ll visit us at Booth B329, September 21st - 25th! AST Products, Inc. will be exhibiting at the 36th Congress of the European Society of Cataract and Refractive Surgeons (ESCRS) next month in Vienna, Austria! We invite you to stop by our booth to test our new Preloaded IOL Delivery System, which we're excited to announce has received its CE mark earlier this month. A product demo area will be available in our booth, where guests can bench-test our new preloaded system for themselves. Check out the animated product demo video below to see our IOL Delivery System in action! We’re excited to be in Washington DC exhibiting at the 2018 ASCRS Annual Meeting over the next few days! We’ll be here at the Walter E. Washington Convention Center through Monday, April 16th. Come see us at Booth 2815, Exhibit Hall B! We’re here for day 2 of the 2018 American Coatings SHOW in Indianapolis! Visit us at Booth 2677 to learn more about our contact angle and plasma equipment! In one week AST is heading to DC to exhibit at the 2018 ASCRS Annual Meeting! As the largest US meeting of the cataract and refractive surgery industry, ASCRS has proven to be a great place for us to network and exhibit our growing line of ophthalmic surgical products. We're looking forward to another busy year and hope to see many familiar and new faces in DC! Join us in the Exhibit Hall at Booth #2815! AST Products is looking forward to exhibiting at the annual meeting of the American Society of Cataract and Refractive Surgery (ASCRS), next month in Washington, D.C.! The ASCRS Symposium and Congress is the largest ophthalmic meeting for anterior segment specialists in the U.S.
AST will be at Booth #2815, Saturday, April 14th through Tuesday, April 16th! AST Products will be exhibiting at the 2018 American Coatings Show in less than a month! The American Coatings Show is America's leading industry trade show for the paint and coatings industry. Join us in Indianapolis, April 10-12th, at Booth #2677! AST Products has arrived in New Orleans for the 2017 American Academy of Ophthalmology (AAO) Meeting! We're looking forward to participating in this year's AAO Exhibition, which begins tomorrow morning. Visit us at Booth #4458, located in the New Exhibitor Pavilion, Hall H.
The 2017 American Academy of Ophthalmology (AAO) Exhibition is now just two weeks away, taking place November 11th -14th. AST Products will be exhibiting at AAO in New Orleans for the first time this year. Look for us in the New Exhibitor Pavilion at Booth # 4458! Introducing our newest intraocular lens injector, the pioli™ IOL Delivery System! pioli™ is an EU CE-marked IOL delivery device designed for the implantation of a single piece foldable intraocular lens into the human eye through a surgical procedure. 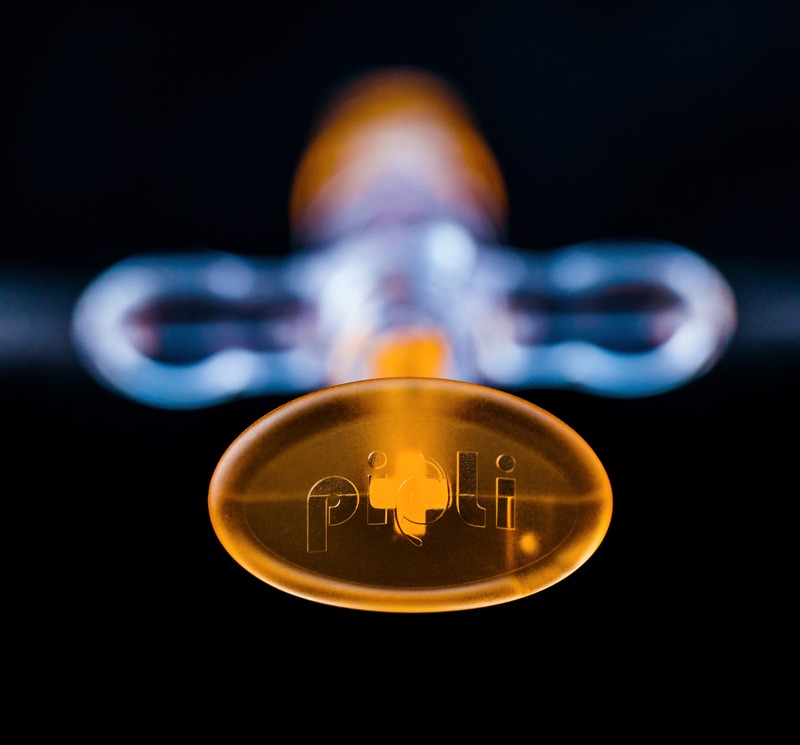 pioli™ utilizes a patent-pending, consistent IOL-folding technology, and features a LubriMATRIX™-treated injector tip. LubriMATRIX™ technology ensures safer, simpler and more effective IOL delivery during cataract surgery. We're here at the XXXV Congress of the European Society of Cataract and Refractive Surgeons (ESCRS) in Lisbon, Portugal! 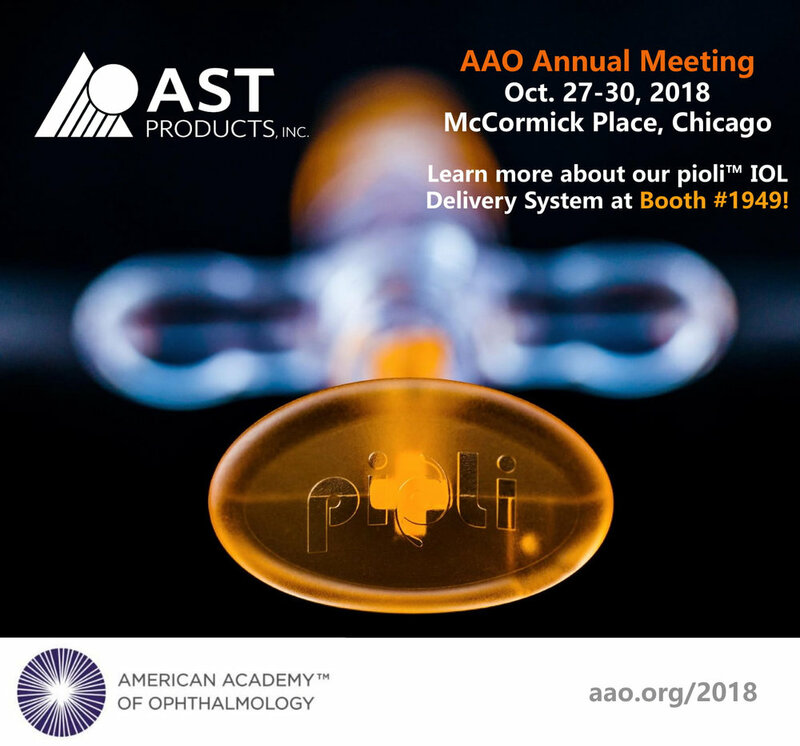 We're excited to talk about our soft hydrophobic intraocular lens, Asqelio™, and our newest product, the pioli™ IOL Delivery System. Visit us at Booth # P124 in Pavilion 1!